← Bah, humbug……or buy now while stocks last! Some thoughts on the Cwm Dyli pipeline. The weather has been almost unremittingly cloudy for the past few weeks but there was one exceptional day recently. A cold front had slowly moved southwards overnight and then stalled, leaving the north Wales peaks beneath blue skies in sparkling sunshine, while further south Aberystwyth remained amid the gloom. In the expectation of a good day I travelled up the previous evening and spent the night in my camper van by the shores of Llyn Dinas, near Beddgelert. It wasn’t a terribly promising start to the day. There was still a veil of cirrus covering large areas of the sky and enough breeze to prevent a reflection in the waters of the lake. But gradually the clearance came and by mid-morning I had clambered high up on a crag above the layby overlooking Llyn Gwynant. Most visitors to north Wales will know it …… everybody stops there and takes a snap. The light was fabulous by that time and one image taken there will be suitable for a postcard at some stage. A little higher up the valley there is a roadside viewpoint to the summit of Snowdon constructed at some expense by the National Park Authority. It would be a spectacular natural landscape if the Cwm Dyli pipeline had never been built, but it was, and I have always passed it by. But on this occasion wisps of cloud were extending westwards from the summit of Crib Goch and passing above and below Yr Wyddfa itself. Despite the pipeline I couldn’t miss this opportunity. Thomas Pennant describes “a very fine cataract” at “the upper end of this romantic valley, Nanthwynant” in the account of his visit in 1770. Now there is also a pipeline. It was built in 1905/6 to carry water from Llyn Llydaw, beneath Yr Wyddfa, to the then new hydro-electric power station at the head of Nant Gwynant. This was the first of its type in the UK, built primarily to supply power to the slate quarries at Blaenau Ffestiniog, five miles away over the hills. Despite the demise of the slate industry, the power station – by now a listed building – was re-equipped in 1990 and the pipeline renewed. There was a campaign to have it buried but in spite of the spectacular location at the very heart of the National Park, it was unsuccessful. One cannot help but believe that if the pipeline had been proposed more recently, it would never have got planning permission. So what does the landscape photographer do? As I had done for many years, drive on by. But not on such a day as this……. A continual stream of cars was arriving and departing the car park so I climbed up the hillside on the opposite side of the road. As I gained height, the landscape opened up, revealing, unfortunately, another length of pipeline. Most of the landscape action was in the top half of the frame, and I knew that I would be cropping the image at the bottom to remove the main section of pipeline. The big dilemma would come later, at the processing stage, when I had to decide whether or not to remove the upper section digitally. I spent a while on the hillside, taking a selection of images with different cloud formations. Then the wind direction changed and the wisps of cloud began to move eastwards from Crib Goch, away from Yr Wyddfa, and the magic was gone. It was time to leave. Actually, I’m pretty hardline about cloning landscape images. In my opinion landscape images have documentary as well as artistic value. Unless an extraneous item is present only temporarily, it stays. So a crisp packet, a post van or a walker in a red cagoule can go, but a telegraph pole or an electricity pylon stays…….. or a pipeline. There are always going to be grey areas, but it really is stretching the distinction to breaking point to claim, as some people do, that any of the three latter features are also “only temporary.” . When it comes down to removing whole landscape features such as these (or adding them….) in order to make an image more superficially “attractive” it creates a false picture of our surroundings. And as far as I’m concerned, that matters. For more on image manipulation, see this post. So I thought I would post the above image online and seek out comments, particularly with reference to the pipeline. It started a discussion about the pipeline, why it was there and what it was for. The photograph’s documentary element tells us all sorts of things about the landscape and how much we respect it. I was also expecting a barrage of “clone it out” suggestions, but in fact there was only one, and a big majority for “leave it in”, despite the fact that in some ways it spoils the picture. There was quite a consensus and I must admit that I was relieved. The rise and rise of the cloning tool has not gone as far as I thought it had done. Just out of interest I thought I’d add an uncropped version of the image which shows the course of the pipeline. I find it disruptive even though it is largely hidden in deep shadow. This entry was posted in Uncategorized and tagged clone tool, cloning, Cwm, Dyli, landscape, outdoor, photography, pipeline, Snowdon. Bookmark the permalink. 7 Responses to Some thoughts on the Cwm Dyli pipeline. I think there’s sometimes a kind of beauty to the juxtaposition of ugly objects with the landscape – pylons, wind turbines and the like. In the case of the pipeline, I didn’t notice it until I zoomed in to a larger photo. Yes, it’s barely visible in the image at the top of the post. But if you click on it you’ll get a bigger image…..I’m not sure if you’ve tried that? Maybe us photographers are just perfectionists; I know I am. Cloning bits in and out of images is quite controversial and there are strong opinions on both sides. Juxtaposing the man-made with natural beauty is often very interesting but a lot of viewers don’t want to know. They just want pretty pictures that don’t ask questions! I did Jeremy, that’s when I noticed it. I can understand people just want to put something pretty on the wall and I’m certainly guilty of that too. I have seen the pipeline any number of times and never find it objectionable. Admittedly its straight lines and uniform colour jarr against the varied shapes, contours and textures of the landscape but, since it is part of a hydro scheme and a relatively small part of the overall view, that redeems it and makes it acceptable. The structure reminds us that even in a seemingly wild upland area, like so many the world over, man has etched his presence clearly. Many of us prefer images of areas such as this that appear as if they untouched, that we should only show their rugged beauty and not the reality; it’s a way of presenting it how we’d like it to be, how it used to be. Those images are valid but ones like this are equally deserving of appreciation. This is one image I’d gladly have on my wall or calendar just as it is presented. Thanks for taking the time to comment. I’ve added an uncropped version of the image for comparison purposes; the main section of the pipeline is visible even though it is largely hidden in deep shadow. You will know it well and I wonder if you agree with me that this landscape – one might call it a jewel in the crown of Snowdonia – would be better off without the pipe. 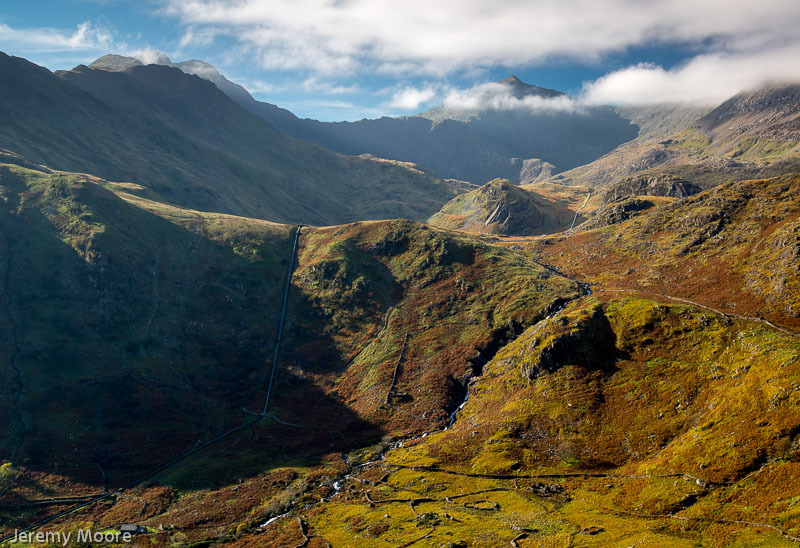 The uncropped image looks so different, and not solely because shows the long length of the pipe that is plainly visible from the Nant Gwynant road to Pen-y-Pass. The area in the lower third takes attention away from the visual pleasure of following the receding ridges and that glorious skyline. I agree that the view, one enjoyed by many visitors from the viewpoint opposite, would be more attractive without the pipe. Although I haven’t been that way for some time, I have a feeling that when absorbing the view the pipe seems less obtrusive than it appears in the second image you posted here. Thanks very much for your comment, Simon.